The Casha poncho is very versatile and easy to wear. It can be worn for many occasions and in many ways - as an elegant coat over day clothing or an evening dress, as a warm cover up whilst travelling or as the sun sets on the beach. It can be used as a wrap, blanket or pillow and is ideal for days when you are not quite sure if you need a coat. The traditional way of wearing your Casha is with the seam (which runs from the neck to the outer hem) on your shoulder, making it hang elegantly off centre. Casha ponchos are made using 100% of the finest Cashmere the jewel of all fabrics. It is a very delicate and fine fibre which requires care and attention. Your Casha will continue to feel soft if you care for it from the beginning. During the first occasions that you wear your Casha you may find it has small bobbles (pilling) in certain areas. This does not indicate poor cashmere, but is part of Cashmere wear. 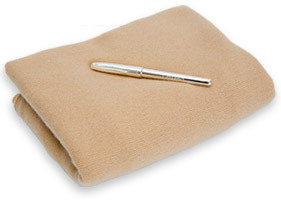 These bobbles can be easily removed by using a cashmere comb. this will also help to avoid moths.